Laghta Eighter Hill is the 978th highest place in Ireland. Laghta Eighter Hill is the most northerly summit in the Sheeffry Hills area. Picture from kernowclimber : A tough nut to crack! Picture: A tough nut to crack! About 4 kms south of Lewisburg we turned down a minor road off the R335. Just before Tully, take the right branch where the road forks. This goes up the Bunowen Valley across a vast bog dotted with farms. It is possible to park close to a small house called ‘Paddy’s Place’ (L85371 75020 A) which brings you close to the foot of the hill, which from here looks quite benign. Having climbed ‘the Sheeffry seven’ the day before, we were expecting similar terrain, as the hill is included in the Sheeffry list. 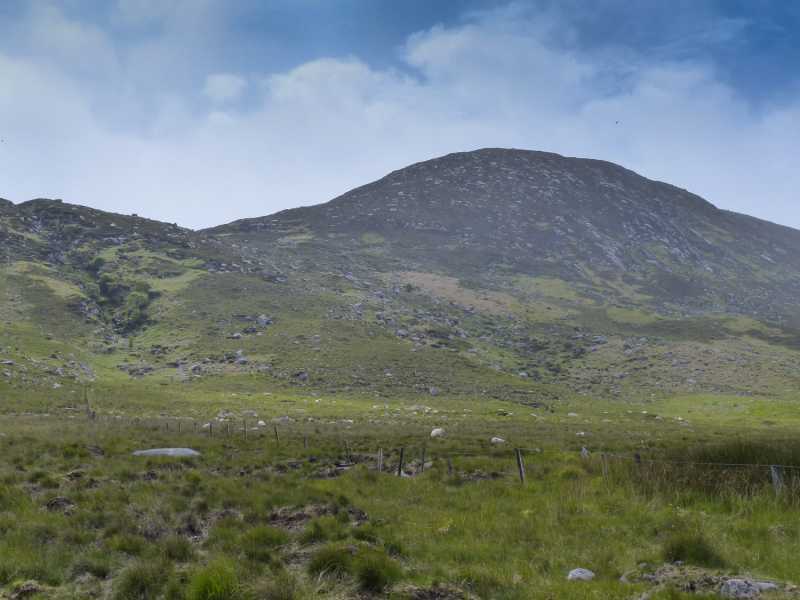 However, we soon discovered that Laghta Eighter is nothing like its bigger brothers as the underlying rock is granite, giving acid rich soils that favour heather, bilberry and bog. The terrain is tough and the gradient deceptively steep. Keeping to the left of a distinct gully to avoid what looked like the steepest, rockiest ground, we struck out across rough pastureland of wiry grass and sly patches of bog. As we started to climb, this gave way to granite rocks and newly unfurled bracken which will become quite dense in places by mid-summer. Above the gully (a geological fault) the terrain flattens to an eroded bog, revealing the skeletal sun-bleached trunks and roots of a prehistoric pine forest. The olive bog nearby is studded with the star-shaped pale green leaves of the common butterwort, each long stem sporting a delicate purple flower. From here there is a further 170 metres of ascent straight up the hill. The terrain is a tortuous, ankle twisting mix of granite boulders, heather and immature bilberry choked with spongy moss and grass. And it’s steep! Tired from the previous day’s exploits and energy sapped by the humidity, we stopped several times to admire the scenery which shimmered in and out of the mist. Knockakishaun, Laghta Eighter’s twin which is opposite, separated by the silvery thread of the Bunowen River, is dwarfed by the Reek rising majestically behind it. Away towards the coast is a vast expanse of brown bog which I imagined was once a deep blue lake fringed by an ancient pine forest whose drowned trunks we had encountered on the lower slopes of the hill. Higher up, the inky grey and blue shapes of the Sheeffrys swept into view and from time to time, the brooding hulk of Mweelrea blinked in and out of the churning cloud.